The thing about Carolyn Chute is that she’s not like other writers. Nothing bores me any faster than stories of yuppie angst and heartbreak (multiple marriages, affairs, fears about growing old, screwed-up kids because their parents are screwed up, blah, blah, blah). Carolyn Chute writes about the other end of the spectrum: people on the fringe, the dispossessed, the poor, illiterate (what’s called in the South white trash but is called something else in Maine where her books are set). These people are fascinating, and in The School on Heart’s Content Road we have a whole assemblage of fascinating characters. Characters who are much more concerned about survival than about their stock portfolios or what wines to have for dinner or what college two-year-old Muffy will apply to when the time comes. The School on Heart’s Content Road is set, for some reason, in the year 2000. It is not about a school but instead centers around four characters: Michael (known as “Mickey”) Gammon, Jane Miranda Meserve, Richard York (likes to be called “Rex;” his mother calls him “Ricky”) and Guillaume (known as “Gordon”) St. Onge. Fifteen-year-old Mickey Gammon smells bad (he doesn’t bathe) and he can’t read, even though he goes to school (or seems to). He lives with his half-brother Donnie Locke and Donnie’s family. Donnie works in an unidentified “chain” (like Wal-Mart) store and is understandably unhappy. He and his wife Erika have a sick child, Jesse, who is bound to die with cancer, whether he has treatments or not. They hardly have enough money for pain medicine for the sick child. Also living with them are Mickey and Donnie’s mother, Britta (she has three kids by three different men, none of whom she was ever married to), their younger sister, Elizabeth, and several of Donnie’s kids from a previous marriage (referred to throughout the novel as the “girl gang”). Donnie throws Mickey out of the house. (“You can’t live here anymore,” he says.) Mickey lives for a while in a tree house with Maine winter setting in. He begins spending time with Rex York, a fifty-year-old Vietnam veteran who has a military bearing and a soldierly attitude toward life (he doesn’t eat desserts and maintains his trim body with exercise). Rex is head of the True Maine Militia. This is a “separatist” group that doesn’t trust the government (with good reason) and will use force if necessary to “take back” (with plenty of guns and ammo) the country that they believe was stolen from them by greedy politicians and an even greedier corporate structure that “steals from them and tries to sell back what they have stolen.” They are a fringe group and have been much maligned by the mainstream media, whose job it is to stir up fear in the public imagination against them. Gordon St. Onge is about ten years younger than Rex York, but they have known each other since they were young. (They consider themselves almost brothers.) Gordon is called (among other things) the “Prophet,” because he is a head of the “Settlement,” a sort of commune/co-op where a bunch of people live and work. Gordon is charismatic and is loved by most of the people who know him and feared by many because he has a lot of (not legal) wives and many children by those wives. It seems that nothing disturbs the public as much as the thought of “polygamy” and a “cult” in which young girls are made to have “relations” with much older men (it isn’t like that in the Settlement). Life seems to be pretty harmonious in the Settlement and the people living there are happy. Still, though, there is the idea that they will overthrow the government in an ugly way if (and when) they have the chance, or possibly even try to secede from the Union. For this reason they are disliked and feared. Jane Meserve is a six-and-a-half-year-old, half-black girl (her father was a black musician with whom Jane’s mother, Lisa Meserve, had one encounter) who is suddenly left without a mother when Lisa is hauled off to jail on a drug charge. When Jane is wearing her heart-shaped, white-framed glasses that allow her to observe things that others can’t see, she is secret agent Jane, adding a lighter touch to the proceedings. She is a wry observer of everything going on around her, smart and clever beyond her years. She and her mother serve to illustrate how unfair and brutal police are (can be) to poor, powerless people. When her mother goes to jail, apparently forever, Jane is taken in by a Settlement family. 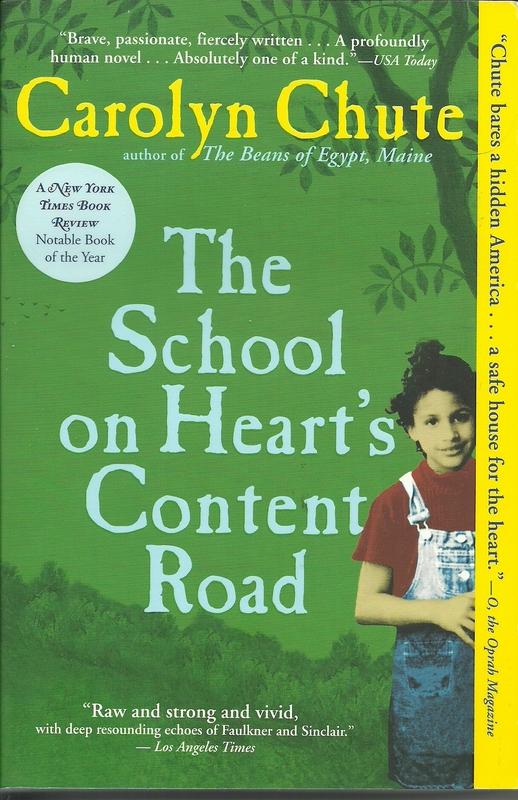 The School on Heart’s Content Road is always engaging reading. The “set piece” of the novel, toward the end, is a long, long (too long) sequence about an open house kind of event at the Settlement where everybody is invited. Hundreds of people show up; there are music, food and drinking. When Gordon speaks, he works the crowd up into a frenzy with his rhetoric about taking back the country and not standing for the government’s lies and double-dealing anymore. There are federal agents everywhere, and word has been circulated that somebody is going to try to kill Gordon. We know something is going to happen but we don’t know what until it happens. It’s not what we expected. If you are a reader of “serious” fiction (as opposed to a reader of Harold Robbins or Jacqueline Susann), you will like The School on Heart’s Content Road. If it was a movie, it would play at art houses instead of at your neighborhood multiplex where they have Ant Man and Jurassic World and all the latest rom-coms. Some of us just want more out of life and we’ll do whatever we have to do to get it. Posted in Uncategorized and tagged Allen Kopp, capsule book review, Carolyn Chute, The School on Heart Content’s Road. Bookmark the permalink.